With an exceptionally curious and open mind, his experiences have given him an extremely broad perspective of professional medical training and a personal triumph that has forced him to cast a wider net when considering patient treatment options. Dr. Julapalli is an influential gastroenterologist in the trenches of conventional and emergency medicine in the Texas Medical Center. When his mother sustained a life threatening brain aneurysm in April 2016, followed by what seemed to be a necessary brain surgery – with the risk his mother may remain in a persistent vegetative state – his personal and professional life shifted dramatically. As an expert researcher, Dr Julapalli took notes from the fields of conventional, integrative, and functional medicine to help his mother. But he didn’t stop there. 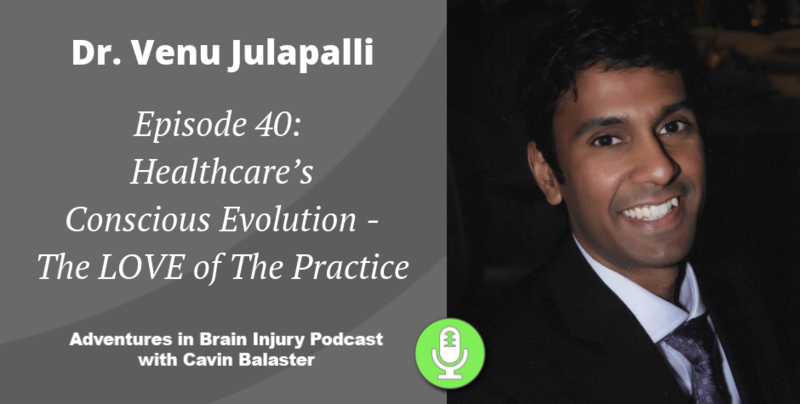 Finding loads of wisdom in advice from patients who had recovered from their own brain injuries, in fact Cavin has worked with him to help his mother, and Dr. Julapalli had been following the Adventures in Brain Injury Podcast for many months prior to this interview. The word “doctor” comes from the latin word, “docere,” which means “to teach.” We learn the most when we teach, and Dr. Julapalli’s approach as a lifelong student puts him as one of the top “doceres” on our list. Join us for a brilliant conversation with an inspirational soul whose life is dedicated to revealing a more conscious path toward care of ourselves and others. That’s amazing Cavin, you wrote that song a year before your injury? That’s scarey in many ways, but equally, inspiring. Fate will not be denied. Thank you for sharing. Dr. Julapalli’s story and life work is fascinating and inspiring. I’m eager to share this episode with others. The obvious dedication, love, and time put into creating this podcast is truly appreciated. Thanks so much, Adrienne! It’s truly a pleasure to do this work!